A high percentage of waste in joinery is due to over-ordering parts. By only ordering the materials we require, we reduce wastage and increase product yield. By segregating our waste, we organise our surplus effectively. We actively encourage members of the public to collect our free wood shavings and offcuts. These can be ideal for animal bedding, compost, fire wood or any home projects you may have! We regularly review and monitor our working practices conducting in-house productivity testing. This allows us to be up-to-date and ensure any undue wastage within working processes is eradicated. 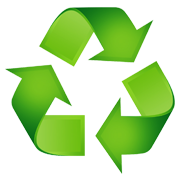 We only use trusted local businesses committed to responsible waste disposal. Our waste is collected, secured and delivered to a site which enables up to 90% of all waste material entering the plant to be recycled. Our staff members participate in our car-sharing scheme. Not only does it save money, it protects the environment from unnecessary emissions!